Did it snow by you? Can you believe it was 54 degrees yesterday!! Being petite can be difficult to find things that fit right off the rack. From shirts to jeans the struggle is too real. My love for trench style vests runs real deep. Dressy, casual, sporty, classic, leather & lace. I also love that I really do rock them even being petite. 1. The trench should hit no more than 2 inches above your knee. 2. No more than 3 below your knee. 3. Also wear heels because you know that never hurts! If it's a little longer take it to a tailor or hem yourself. Making sure you create a long sleek line makes you appear taller. Not that I wan't to be taller but man being over 5'0 feet would be nice! The best thing about these trench vests is have fun with them. I love this one in particular because of the faux fur. and so happy I kept it after all these years! So tell me do you own a trench style vest. Thank you so much :) That vest is a favorite! I love the one you are wearing. Anything with faux fur is the best because it's so cozy and luxe! Thanks girl I love this vest too because well duh the faux fur is key! I love the length of this faux fur cape! Way too cute! Meg thank you! One I didn't have to hem which is a huge plus! We had snow here in Kansas the week before Christmas but then on Christmas it was 60 degrees!It felt so tropical and weird! This is a lovely outfit on you and the fur vest is the perfect choice for this! Cute outfit! Loving that vest! You definitely know how to rock the petite style! That vest is so gorgeous! Loving that faux fur trench, doll- so good for temperate winter days! Thanks Ashley! !It really is or when I want to look put together and go shopping! I love this vest with the faux fur collar. Great winter look! Happy New Year's! Thank you! I love this vest too! So glad I kept it after all these years! 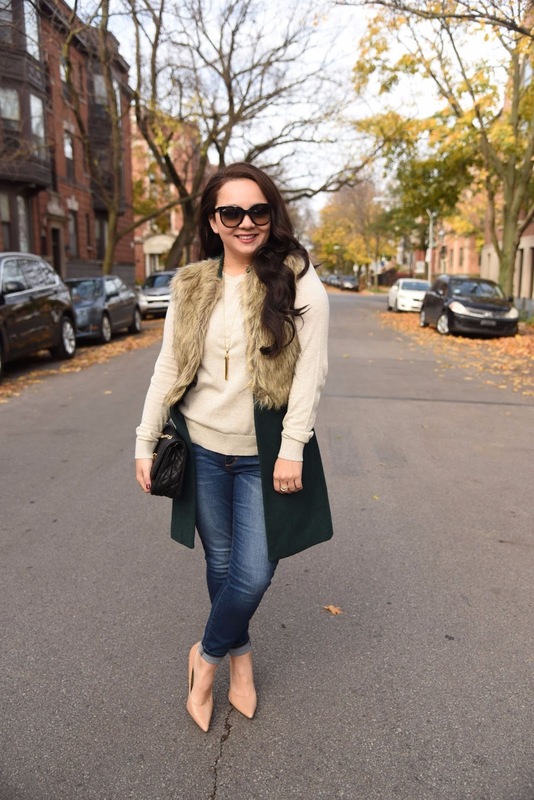 I love that faux fur trench style vest, I think looks good on you!